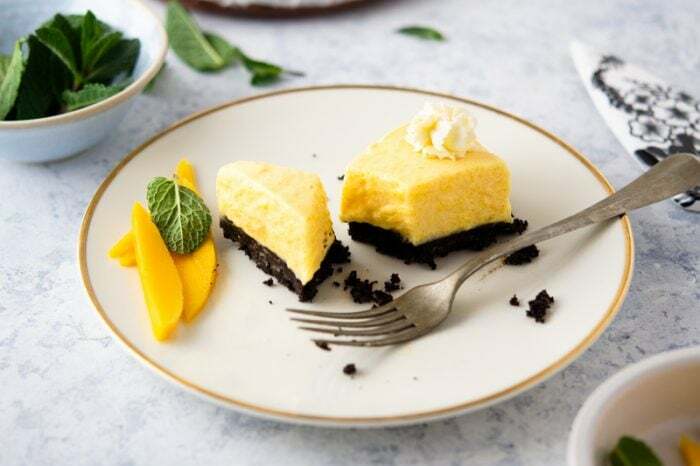 Celebrate mango season with this luscious No-Bake Mango Pie that’s easy to make and perfect for sharing with family and friends. Spring means mangoes and lots of them. If you’re in Mexico or Guatemala, you can buy them by the kilo from the back of trucks, in the markets or pick them from your own backyard tree. You can even find boxes of mangos on sale in the produce departments of supermarkets throughout North America. Deciding what to do with a giant box of ripe mangoes can be a challenge. After all, there are only so many Mango Margaritas a person can drink. 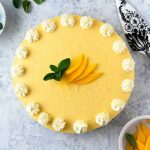 If you have a bounty of ripe mangos, this recipe for fresh No-Bake Mango Pie is easy to make, requires no baking and is delicious. And best of all, it uses a lot of mangos. It’s important to use the right kind of mango for this No-Bake Mango Pie. And if you’re confused by all the mango varieties you see in the market, you’re not alone. 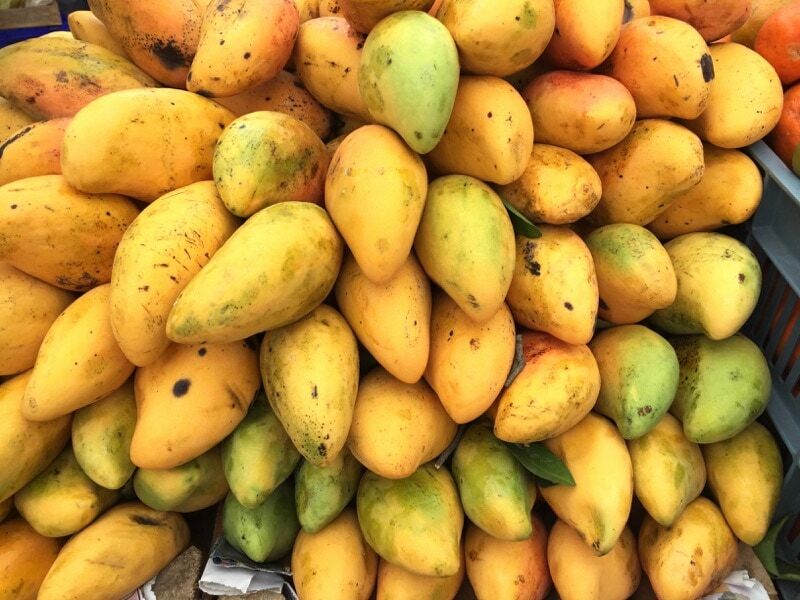 One thing I discovered about mangos while attending the Mango Festival on the Caribbean island of Nevis is that there are more than 1,000 varieties of mangos in the world. Popular throughout Thailand, India, Pakistan, the Caribbean and Mexico, each region has their favourite regional variety. In Mexico, Guatemala and the rest of Latin America, the most common varieties are the Ataulfo and the Manilita, both of which are descended from the Manila mango from the Philippines. 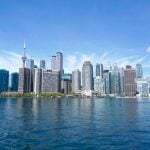 Along with other goods such as spices and even priceless artworks, they were brought to Mexico in the 1600s on the sailing ships during the galleon trade between Manila and Acapulco. The majority of Mexico’s mangos are grown in the state of Guerrero however the state of Chiapas is recognized by the Mexican government for its “Mango Ataulfo del Soconusco Chiapas” an appellation of origin (much like dijon mustard in France) signifying where it was first grown by Ataulfo Morales Gordillo. Learn more about mangos, take cooking workshops from celebrity chefs and enjoy fine-dining on mango-themed cuisine at the Nevis Mango Festival. Ataulfo mangos are the best ones to use for this recipe. This type of mango has a flattened oval shape, firm yellow flesh and a soft, sweet inner pulp with few fibers that makes it ideal for smoothies, Mango Margaritas and desserts. If you’re shopping for mangos in the United States, note that the Ataulfo mango may also be known as the honey mango. Mango fans might be interested to know that mango trees (Mangifera indica) are a deep-rooted species of flowering plant that’s a member of the sumac family Anacardiaceae — a family that also includes pistachio, cashew and poison ivy. 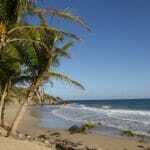 Note: If you are allergic to poison ivy or cashews, you may also be allergic to mango fruit. 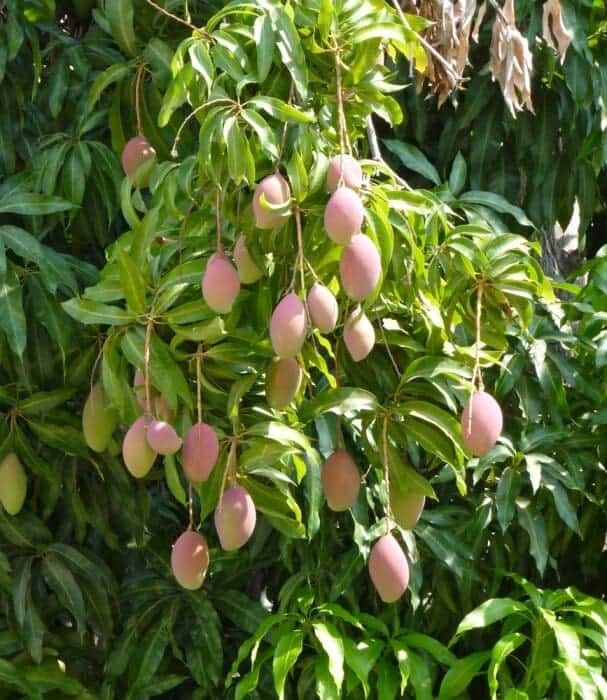 Unlike papaya, another popular tropical fruit that grows on relatively short plants, mango trees can grow to 40 metres or 130 feet tall, producing hundreds of mangoes on each tree. Mangoes are an evergreen plant that begins fruit production in three years and form fruit quickly, producing abundant crops from March through the beginning of summer. Which means they’re perfectly ripe and ready for spring desserts. Packed with Vitamin C, Vitamin A, dietary fiber, potassium and anti-oxidants, mangos are one of the world’s healthiest fruits. Their sweet, creamy texture also makes them one of the tastiest fruits to use in desserts. Much like in summer, when you can find yourself wondering what to do with too much zucchini or ripe tomatoes, deciding what to do with a giant box of ripe mangoes can be a challenge. After all, there are only so many Mango Margaritas a person can drink. If you have a bounty of ripe mangos, this recipe for No-Bake Mango Pie is easy to make, requires no baking and is delicious. And best of all, the mango mousse you’ll create for this recipe uses a lot of mangos. 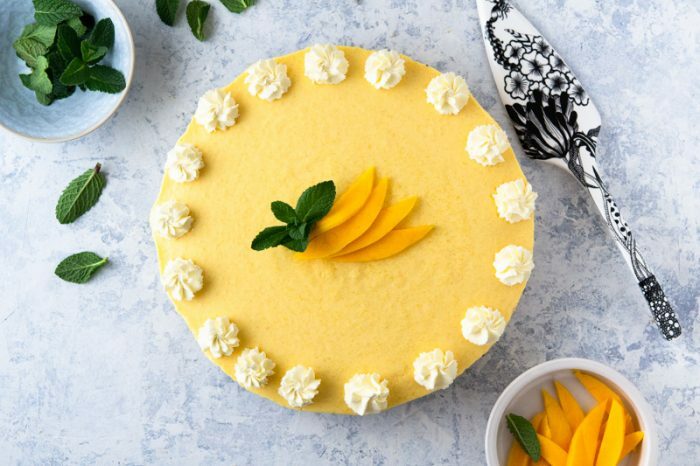 So, go ahead, buy a bag of mangos and celebrate mango season by indulging in this light but luscious dessert perfect for sharing with family and friends. Spray the bottom and sides of a 9-inch springform pan with vegetable spray. Then, melt the butter and combine with chocolate crumbs, pressing it into the bottom of the pan. Chill for a few hours in the refrigerator. You can make this in advance if you like and leave it covered overnight in the fridge. 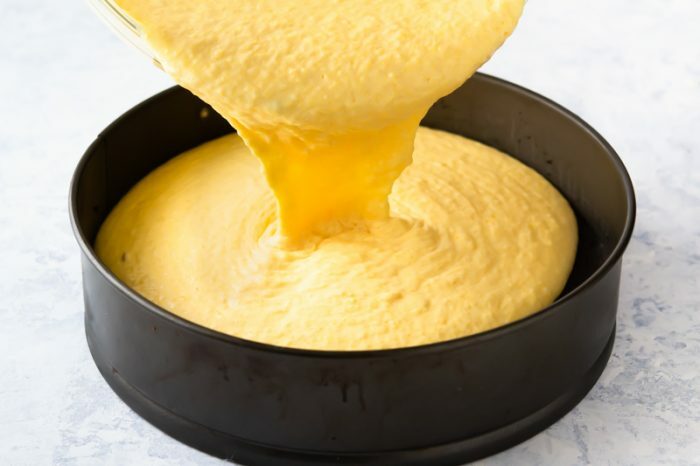 While the base crust is cooling, heat the mango juice in the microwave until very hot and add the Jell-o powder, stirring until completely dissolved. Vegetarians can use agar-agar powder as a substitute for the gelatin. One generous teaspoon of agar powder is equal to one teaspoon of gelatin. Place the juice and gelatin mixture in the refrigerator to chill until slightly firm. Wash, peel and core the mangos and process in a food processor until smooth. 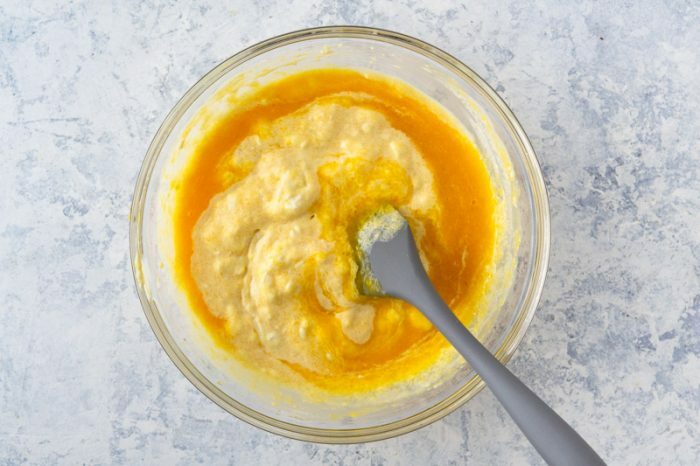 Once the gelatin and juice mixture is slightly firm, fold it into the mango puree, stirring until blended. Whip whipping cream until peaks form and gently fold it into the mango and gelatin mixture. Then pour it the mango, gelatin and whipping cream mousse into the springform pan lined with chilled chocolate crumbs. Chill for five hours and then garnish with mango slivers, whipping cream and fresh mint. If you can’t find fresh mangos, you can use a bag of frozen mango chunks or even a can of mangos. If you use canned mangos, save the juice when draining the fruit as you can use it for making the gelatin. 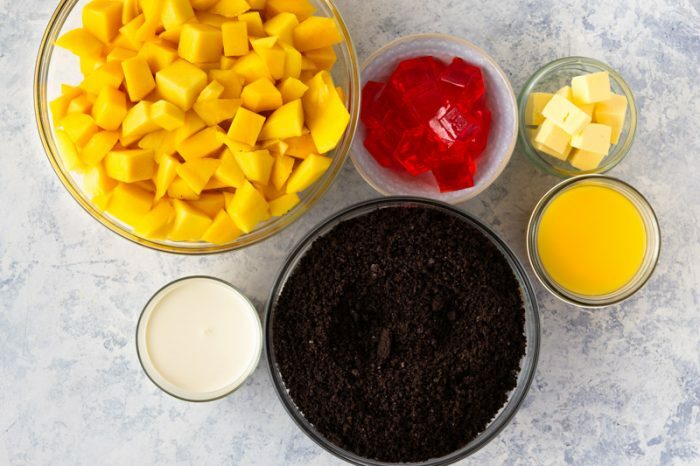 You can substitute 2 packages of Knox gelatin for the flavoured Jell-O if you use mango juice. Vegetarians can make this delicious dessert by using agar-agar powder as a substitute for the gelatin. One generous teaspoon of agar powder is equal to one teaspoon of gelatin. 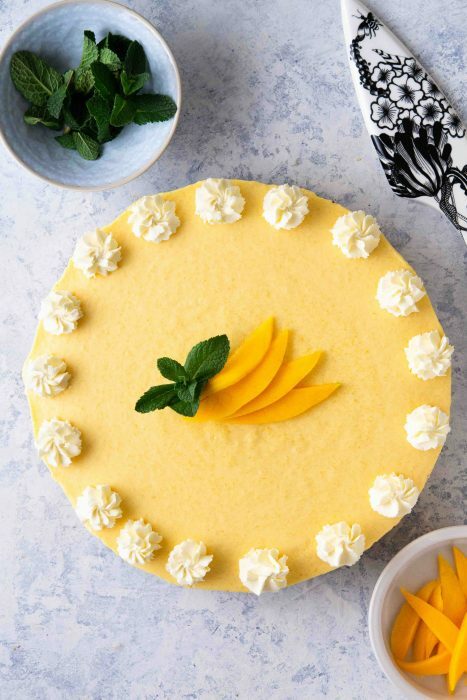 No-Bake Mango Pie is a perfect spring dessert … guaranteed to disappear off the plate! Spray a 9 inch springform pan with vegetable oil. 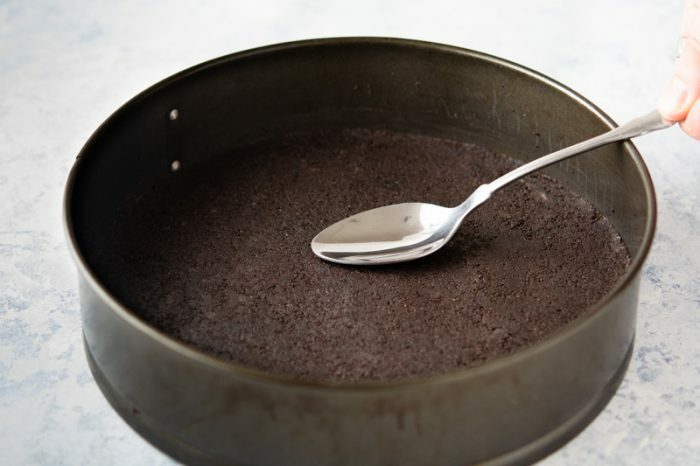 Melt butter and combine with chocolate crumbs, pressing into the bottom of the pan. Chill for a few hours in the refrigerator. Heat mango juice in the microwave until very hot and add the Jello, stirring until dissolved. Place in the refrigerator to chill until slightly firm. Wash, peel and core the mangos and process in a food processor until smooth. 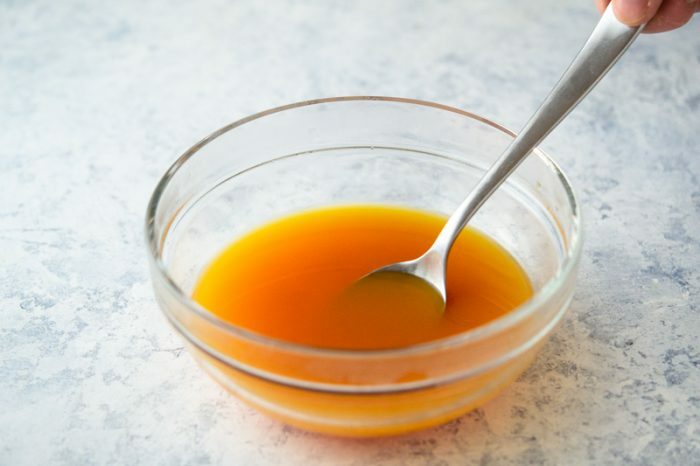 In a separate bowl, fold the gelatin into the mango puree, stirring until blended. Whip whipping cream until peaks form and then gently fold into mango and gelatin mixture. Garnish with mint leaves, thin slices of mango and whipping cream. I absolutely love mangoes – they are by far my favourite fruit. Here in Chile they are far too expensive to buy – and not very good. At home in Australia we live in an area where they are also available in large quantities to just enjoy. I’m a mango fan too Michele so this quick, easy recipe appeals to me. Mango season has just finished for us in Australia so I’ll have to wait a while to try it! We just bought enormous mangoes here on Mallorca this morning. I would love to make this recipe! 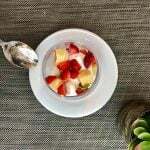 Thanks for sharing this delicious recipe, so light and tasty, a touch of the tropics! i love mangoes, too, and know I would enjoy this dessert. Thx for sharing the tasty recipe. 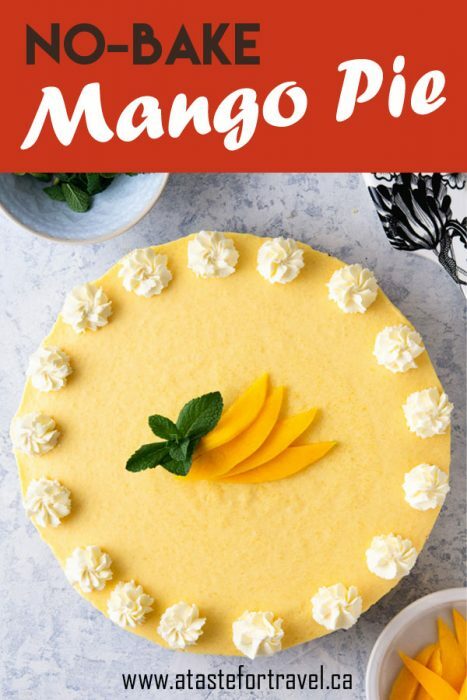 I’m not a huge fan of mangoes, but that recipe looks yummy. You can put anything in a chocolate crumb crust and I’ll eat it! This recipe looks easy and yummy. The only problem is preparing the mangoes. I hate cutting up mangoes. But I love eating them. I just tasted ataulfo mango for the first time last week. It was sooo good. I hadn’t realized there were different kinds of mango. This recipe looks good. This recipe is a keeper! I didn’t know there were different types of mango. Makes sense to look for the smoother-textured ones to make mango smoothie pie. How did I miss mango season? Must be Chicago is a bit slow. 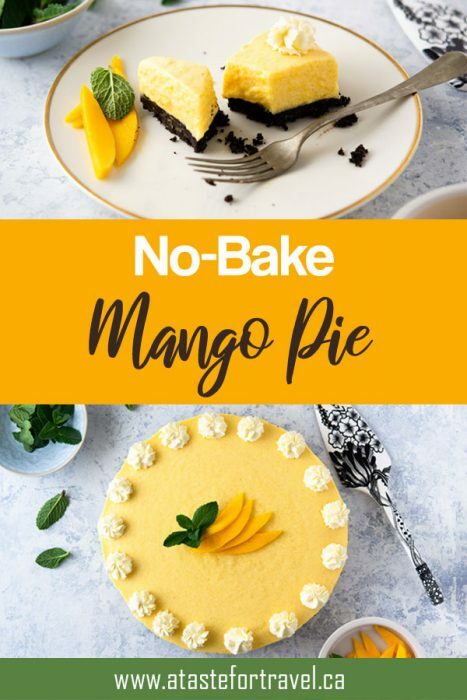 Have to get some mango and try this smoothie pie looks yummy. I’m bookmarking this as we will be in Hawaii soon, surrounded with mango trees, can’t wait to make this pie. I’ll never forget the first mango I tasted. It was in the Philippines and I still have dreams about the delicious flavor. Can’t wait to try this recipe,although I might try to lighten it up with Greek yogurt. It looks mighty good and so easy! I love mangoes, and this pie is stunning, and sounds delicious! Pinning to try. I think my kids would absolutely go crazy for this dish. We didn’t eat mangoes growing up but my kids do and love them. Plus the chocolate base – looks fabulous! This mango pie looks like such a wonderful treat, and I love that it’s no bake too! Can’t wait to try it out!